The genre that stagnated? | Moe for moe? Even though many might disagree with me, I want to bring up something about all those visual novels/dating games/galge-games which bugs me and take a guess at why the genre, in my eyes, have been stagnating pretty badly over the years. As per usual, I lack much of the knowledge needed to actually write an in-depth article about the subject so it turned out a long rant instead and it’s all going to go downhill from here so let’s get cracking! First off, I just find it’s pretty hard to label some of these games correctly because some are strictly more or less interactive novels while others can have RPG, tactic, dungeon crawling or adventure game elements. But this is also one of the reasons why I am writing this. 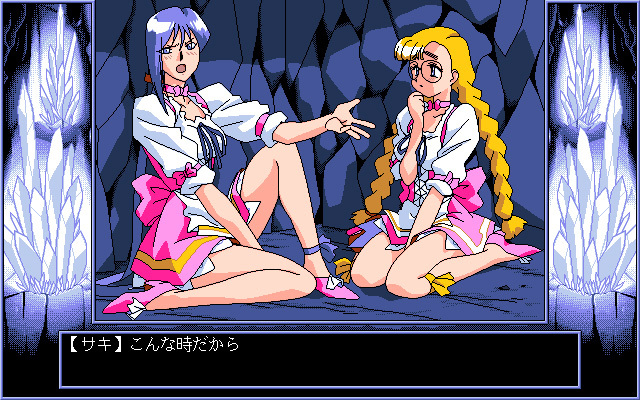 When I got into these sort of games a few years ago, I found mostly games that were strictly visual novels. Pure storytelling to the point where it pains me calling them proper games, they’re more like those “choose your adventure” type comics, only occasionally pausing to ask vague questions whether I want to head home from school or stay for a little longer. And then, there was the graphics, the part of the game that is supposed to appeal it’s audience. Having no prior experiences or expectations, I was easy enough to please – “pretty pictures” in decent resolution worked fine. Only when I started digging for old gems did I understand how “boring” the visuals in the newer games actually was. So, have I finally lost it? Calling these pretty games boring to look at? We’ll discuss this later on. Allow me to explain further; This doesn’t really apply to the newest games, since we have this weird flash-like tweening animation going on (at least I believe it’s tweening) that makes pretty pictures move. However, games slightly older basically looked like this: You had a background image, on top of that an image (or images) of a character and of top of that you have the speech boxes and menus. The character image, or sprite if you want, gets swapped out for another one to reflect what’s being said or occuring in the story. Occasionaly you get a special, fullscreen (well, fullframe) image that depicts key scenes in the story. Also, if the game feature adult content, this is also how that would play out. Parts of the image can usually be swapped out, expressions and so on. This all look very good but it is also very, VERY static. 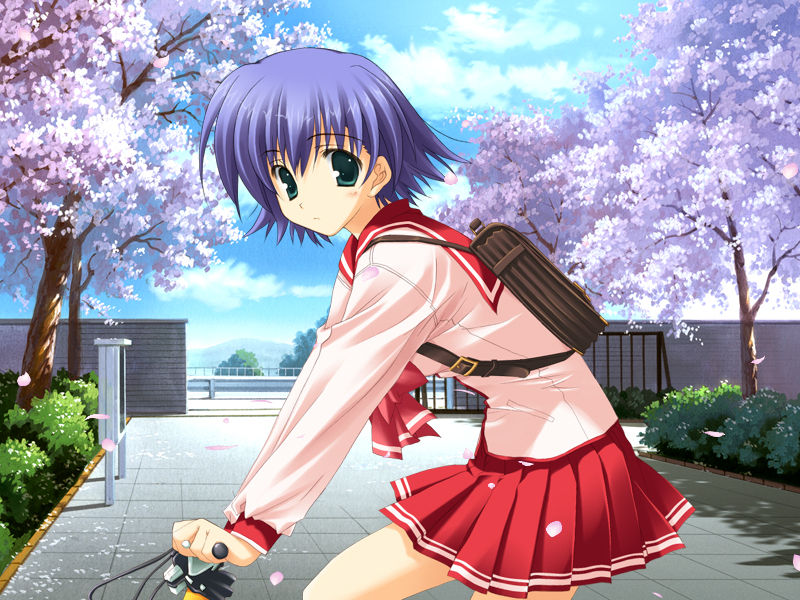 Sometimes, graphical effects like explosions or falling sakura leaves are added on top of the other images in order to liven things up. This is pretty much how games like ToHeart 2, Yoakena and Fortune Arterial does it. (I often mention these because I have actually played them for varying amounts of time). Now, let’s look at older games and how they differ from these oh-so-pretty but rigid newer games. 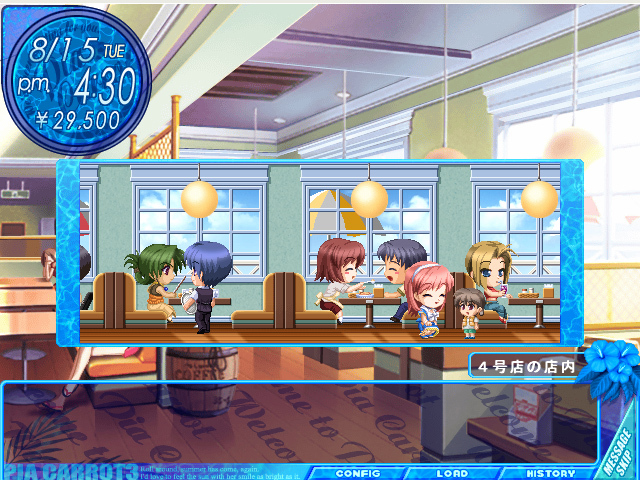 While most newer games mostly seem to fall within the same genre or category, that is, pure visual novels, older games often have more gameplay elements. Sometimes it’s the other way around, with the gameplay being the actual point of the game and this specific style of storytelling just added because it’s an easy but effective way to let the player experience the story. What’s most striking with older games such as the Pia Carrot-series or perhaps Comic Party is the fact that they are usually animated, or contains animations in some way or another. Eyes closes and opens, characters mouths moves when they speak, different poses might have animation inbetween or perhaps an action is accompanied by an animated sequence showing said action being performed. This is something I really like, if well performed it increases quality-feel of the game remarkarbly. They say it’s the little things that makes something stand out and this is definitively true in gaming as well. So, what happened then? How did we go from animated, immersive storytelling games to beautiful but stiff somewhat interactive stories? Well, the easy way out would be to say that the genre evolved according to the audience wishes and call it a day but, lets’ try to look a the whole thing a bit closer. 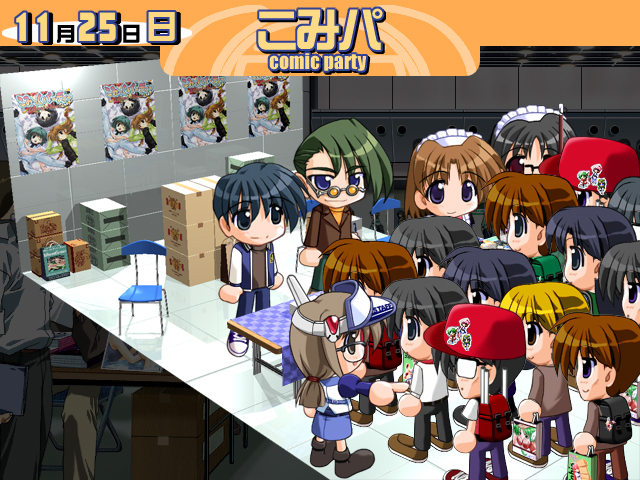 Comic Party and Pia Carrot 3 were released 1999 and 2001 respectively while ToHeart 2 and Yoakena were relased only a few years later in 2004 and 2005. So, just as the 90s ended and we entered the 2000s something must’ve happened. My guess? Two very specific things, namely, higher resolution and the increased poularity of softly colored images done in Photoshop and similar programs. Let’s face it, the old games relied heavily on pixel graphics and were often held back by color or/and hardware limitations whereas the new ones can use any and how many colors they want and will have to do something serious to stress the hardware. (Well, it usually gets stressed still because of shoddy programming and so on but I digress). With screen resolutions increasing as computing technology advanced, new games better follow suit. You see, both Pia Carrot 3 and Comic Party run in 640×480, which was common for PC games of the same type back then, as opposed to 800×600 which became the new standard. But the lower resolution is not only something negative, it also has an advantage. It’s easer to work with. Really. You know how games today requires a big, expensive team of developers and still takes years to finish? That’s because they have to work in higher resolution, with highly detailed 3D models and worlds that require both time and effort to look at least decent. If the reasoning behind this is a bit hard to grasp, picture this then: Make a little square on a piece of paper. Now draw something in it. Then make a much bigger square and draw the exact same thing but also bigger in size, you will notice how much more effort you need to put in to make it look just as good as the small image and how the time needed increases accordingly. So, heightened resolution equals more work. That still don’t explain why all games stopped being so awesomely animated! But, we will get to that now. As I mentioned earlier, coloring in Photoshop and similar programs enable artists to create the most beautiful images…at a price. They can’t easily be animated since each frame would need to be a separate or edited drawing and when too much detail goes into the coloring process, it’s really REALLY hard to keep things looking the same. A soft-CGed animation would almost be impossible and most definitively not a good idea for anyone with deadlines to meet. On the other hand, sprite art is more easily edited because the color palette naturally becomes more specific and it’s just generally practical in many other ways making it more suited for animation. It’s also very sharp, making lines easy to see and coloring very effective. Either way, more and more games started using CG images, probably since it was very cool back then, with all the pretty colors, shading and gradients. Perhaps not too many complained about the rigidness of it all. Perhaps most fans of the old stuff probably was no longer considered part of the target audience because they had to work or they became outnumbered, I don’t know really, but now things seem pretty much locked in this style. BUT. 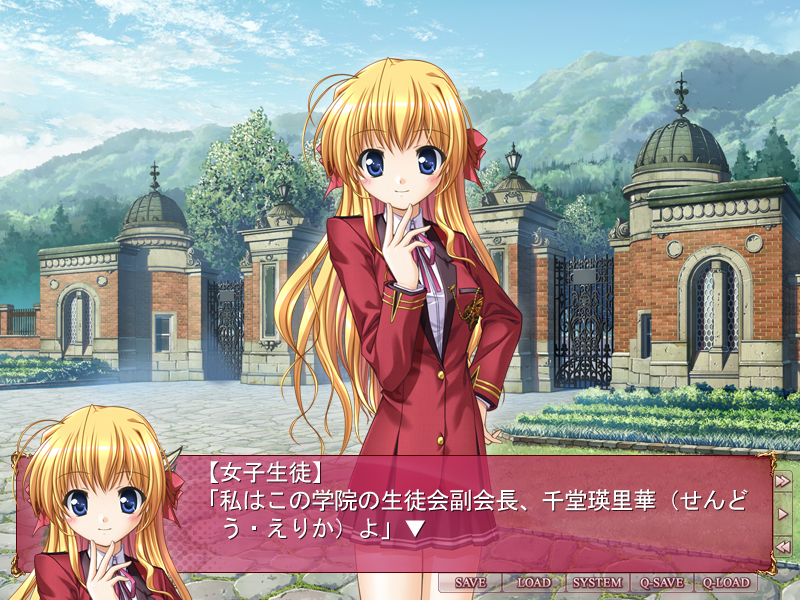 As I said in the beginning, it seems the future of visual novel-type games is animated after all. Just not in the same way, but still. …on an ending note, both Pia Carrot 3 and Comic Party can be pretty stiff as well. If you’re really looking for animation goodness, and don’t mind adult content, look for the Viper-series on PC98 and Windows. That is all, I think I forgot where I was going with this post. Oh well. . .